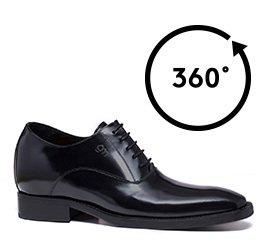 Elegant and charismatic the new dress elevator shoes, oxford model, with upper in semi-shiny calfskin leather. The insole and outsole are in genuine leather assembled and sewn at sight. The invisible inner height increaser can be selected from 2.4, 2.7 or 3.1 inches. Refinement and handmade quality, perfect for the groom and formal occasions.